It’s a secret every stand-up comic must master if she or he is to have any chance of success. “The Comedian” is an 85 minute dramedy trapped in a two hour movie. Another version of the “bitter old comic tries to grow a heart” story, it is built around an amusingly grating Robert DeNiro performance utterly immersed in the down and dirty world of stand-up. Director Taylor Hackford (“Ray,””Dolores Clairborne”) lets every off-color set Jackie Burke (DeNiro) launches into go on too long, lets too many static scenes with big-name bit players make the final cut. “Comedian” never knows when enough is enough, or when too much is unnecessary. Jackie Burke’s an insult comic living in an insult comic’s version of Hell. Everybody over a certain age recognizes him. And nobody can call him by his real name. Thirty years ago, he played a cop in an inane sitcom, with inane catch-phrases. Everybody loved “Eddie’s Home.” Nobody loves Jackie. The best his long-suffering manager (Edie Falco) can do is attach him to “nostalgia” stand-up nights with the likes of other ex-TV stars like Jimmie Walker (“Good Times”) and Brett Butler (“Grace Under Fire”). Bitter? Yeah. But Jackie’s still quick off-the-cuff, even if he never seems to know when he’s crossed the line with audience, or if there is such a thing as a line. But loose cannons like Jackie can still draw an online crowd. A confrontation with a comic-baiting web series host goes viral, even as it puts Jackie in court. And when he’s ordered to apologize and do community service for punching that jerk, Jackie takes 30 days in the joint. Enough is enough. He is escorted behind bars to a convict chorus singing, and clanging their coffee cups in time, the theme song to his old show. When he gets out, he still has community service. Even at the soup kitchen, Jackie’s “on,” working the homeless, coming up with material. If only he could get one more break. In person and in interviews, DeNiro is a shy and reticent man, so it’s almost awe-inspiring every time he takes on an extrovert like this. He’s perfectly believable as a Jackie Mason type — a stand-up with an imperious bitter streak and serious anger-management issues. 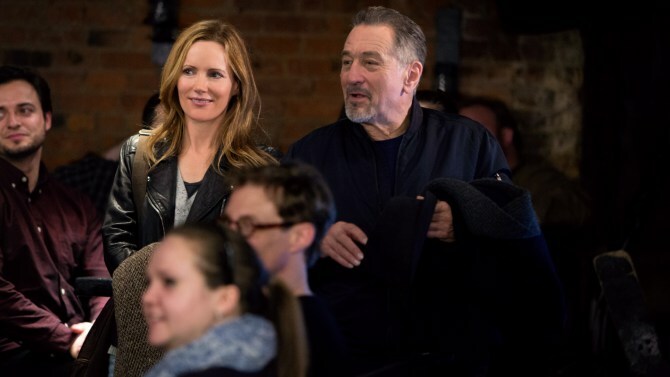 Then Leslie Mann shows up at that same soup kitchen, an irritable community service sentence “victim” with jilted lover issues, daddy issues and the like, and we see what’s missing in The Great DeNiro. Mann is funny in her bones. DeNiro can swap rehearsed zingers with a raft of stand-ups (Jessica Kirson, Hannibal Burress, Jim Norton, Nick DiPaolo), yelling from the crowd or exchanging punches on a comedy roast dais. His timing is superb, and we can believe he’d find R-rated laughs in the audience when he’s shoved, unprovoked, onstage at a senior citizen’s center or handed the mike at his niece’s Jewish lesbian wedding. But Mann, playing the put-upon daughter of an out-of-town mobster (Harvey Keitel) makes every double-blink, every stammer or hesitation in her voice, every hearty laugh hilarious. DeNiro reminds you of every backstage documentary about comedians (Jerry Seinfeld’s “Comedian,” certainly), the ones that reveal how mean, competitive and cruel they can be. 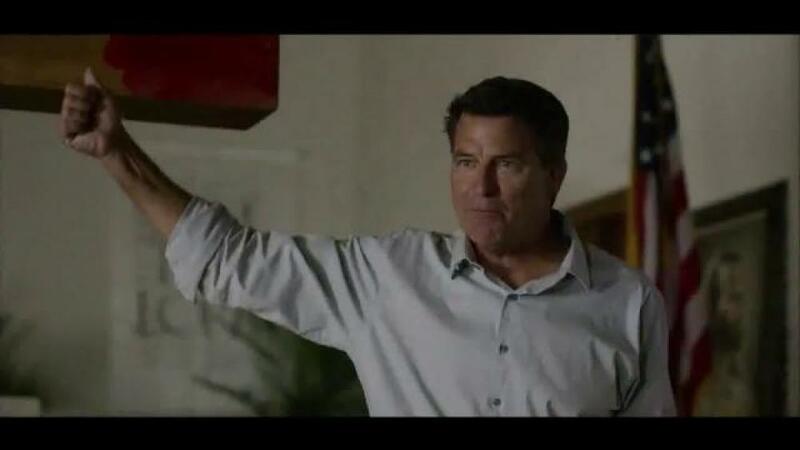 Mann is just…funny. Their scenes together sparkle as Mann softens DeNiro’s textbook comic edge, makes him human. The script, co-written by raunchy comedy roast vulgarian Jeffrey Ross, has a few laughs on stage and a lot more grimaces. Jamming Danny DeVito and Patti Lupone in as Jackie’s long-suffering brother and testy sister-in-law — cliches, the both of them — pays-off. And Cloris Leachman has a funny third act cameo. And the possibilities of June-December romance seem like a hackneyed non-starter, and icky to boot. Hackford, DeNiro and the movie are more at home in the seedy dives that are Jackie’s purgatory, clubs so down on the heel that it’s no wonder he sees the nothing-to-rave-about Comedy Cellar in Manhattan as his Mecca, a dump he must earn his way back into. Too often, though, this “Comedian” is — like many a desperate stand-up — content to go for the dirty/easy laugh, the kind you see coming a mile off, the kind you feel coarse for rewarding with a snicker, the kind you can hear in any high school locker room. Credits: Directed by Taylor Hackford, script by Art Linson, Jeffrey Ross, Richard LaGravanese and Lewis Friedman. A Sony Pictures Classics release.